Adamčík S. & Jančovičová S. (2011) Pseudobaeospora terrayi – a new species from Slovakia. Pseudobaeospora terrayi is described and illustrated as a new member of the genus defined by (1) yellowish-greenish discoloration in 5 % KOH, (2) pileipellis with a well developed suprapellis of narrower aeriferous hyphae and wider hyphae in the subpellis, (3) relatively small, slender white basidiomata with distant gills, and (4) with cheilocystidia. Differences from similar species are discussed. Observations and comparison with the type specimen of P. paulochroma, the most similar species, are provided. 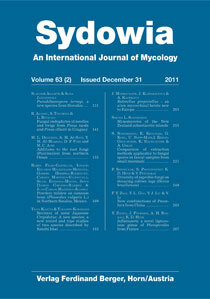 Keywords: Agaricomycotina, fungi, biodiversity, systematics.